The Reunion Tower gives you a picturesque view of Dallas that you can’t get anywhere else. Upon entering Reunion Tower, you’ll purchase and/or scan your tickets and wait to go up the elevator for a 60-second lift up to the top. Once on the GeO-Deck, you can see the shapes that line the city and the colorful lights that brighten the night sky. However, from such a vantage point your carrot-powered superhero eyesight won’t be enough to catch all the details. Luckily, the Reunion Tower’s GeO-Deck offers access to high-def zoom cameras, telescopes and interactive touch screens so you can fully immerse yourself in Dallas culture, architecture, and history while you’re 470 feet in the sky. Technology brings adventure to a new level in Dallas’ Reunion Tower. With the power of its "Halo screens," you can see beyond the architecture of Dallas’ buildings and explore the city’s attractions with detailed images and descriptions. You can also be a star in a constellation of other guests by creating an avatar, describing your experience and your geographical information, and making your mark on the series of touch screen monitors that make up the great Reunion Tower star map. Ticket prices vary depending on which spectacular view you want to see from the GeO-Deck. You can’t go wrong, but the Day and Night Ticket is the best of both worlds. You’ll get to see the view during the daytime hours and also later in the evening without having to pay for two general admission tickets or hanging around all day. Groups of 15 or more people can get discounted rates (inquire for detailed pricing information). Though the view from the GeO-Deck is enhanced with interactive screens, high-powered cameras and telescopes, some have felt the duration of their trek through the tower was a little short. One way to maximize your Texas travel time and pack in as many Dallas attractions as you can is with Dallas CityPASS tickets. We might be biased, but we think it’s the best way to save on multiple attractions throughout the city. You’ll save 39% on admission to the top 4 Dallas attractions. Plus, CityPASS ticket holders can upgrade to the Day and Night ticket for only $5. Reunion Tower is open daily, but hours vary throughout the year due to holidays and special events. You can visit their website for an accurate calendar that reflects hours of operation for both the GeO-Deck and the restaurants. If you’re driving to the Reunion Tower, parking is only $6 for four hours. There are other parking lots nearby if you want to pay for all-day parking and explore nearby restaurants or attractions. If you plan on taking public transportation, you can arrive via train (DART) at Union Station and take a six-minute stroll to the Tower. Cloud Nine Cafe is a casual eatery where you can enjoy some food and drink with a revolving view. Enjoy a salad or sandwich, or go all out with the Signature Cloud 9 Tower -- a prodigious dessert made up of devil’s food cake, chocolate mousse, and fresh berries. 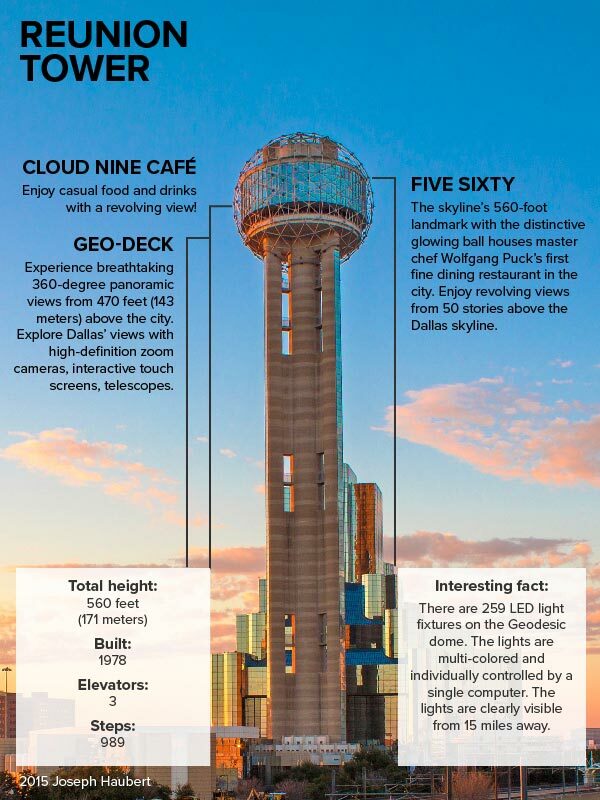 Plus, the rotating view means you’ll get to eat your meal and see Dallas 360 degrees around! Cloud Nine hours vary, so it’s recommended to check online or call ahead. Photos prove to friends and family that you did what you say you did, but more importantly, they’re mementos that you can share and reflect on for years to come. The GeO-Deck is a great place to take some beautiful photos of the city skyline, day or night. The Reunion Tower has a beautiful LED light display that reflects in brilliant colors over the dark waters of Trinity River. The tower also has its own photo booth that gives you a chance to flaunt your silly side with fun props and costume pieces that’ll make for a great souvenir photo. No upsells here - the digital photo is available for free with your ticket! It’s always best to plan ahead and check online for events that may shift or shorten the Tower’s hours of operation. To make the most of your time at the Reunion Tower, check out the calendar online for special events. Most of the fun activities taking place at the Reunion Tower are free with general admission. The Dallas Zoo teams up with the Reunion Tower throughout the year bring fun animal interactions to the observation deck. The online calendar is the best way to plan your visit around the activities you want to do. Valet parking is only $5 if you’re eating at Five Sixty. The dress code at Five Sixty is business casual (collared shirt, no shorts). There’s no kid menu - perfect excuse for date night! Create a constellation of your visit! Add your name and where you’re from to a star on the GeO-Deck touch screen monitors.